You'll be £8.00 closer to your next £10.00 credit when you purchase Hamilton and Gallipoli. What's this? This is a study of Sir Ian Hamilton VCs command of the Gallipoli campaign. Appointed by Kitchener after the failure of the initial Allied naval offensive in the Dardanelles, Hamilton was to lead the ambitious amphibious landings that were intended to open the way to Constantinople. In the event, however, opportunities immediately after the landings were squandered and, in the face of unexpectedly effective Turkish resistance, soon stalled in attritional trench warfare like that on the Western Front. Hamilton has often been criticized for this failure and in many ways seen to typify the stereotype of a British general clinging to outdated Victorian thinking. Yet this fresh reappraisal, drawing on original archival research, shows that Hamilton did display some progressive ideas and a realization that warfare was rapidly changing. Like all generals of this period he faced the challenge of unprecedented technological and tactical revolution as well as the political and media battle. It is as a case study of command in these circumstances that Evan Mcgilvray's assessment of Hamilton will be most valued. General Sir Ian Hamilton comes under the spotlight once again. It has been in vogue for many years to trash the Great War generals. The stereotype of the aged, bumbling, and murdering ‘Blimp’ type British general officer has been a favourite of many. Some in Britain and across the world still believe this stereotype to be true to life. While a number of the generals at Gallipoli, Hamilton included, were old, out of their depth and (in some cases) useless, it is not a true depiction of all of the British generals in the Great War. Sadly, Hamilton’s failure at Gallipoli fuels the general myth, even though the failure was not his alone. Nonetheless, McGilvray’s book does not tread the old, worn path of ‘general bashing’, instead it seeks to re-examine the man’s character and give him a fair hearing. ... 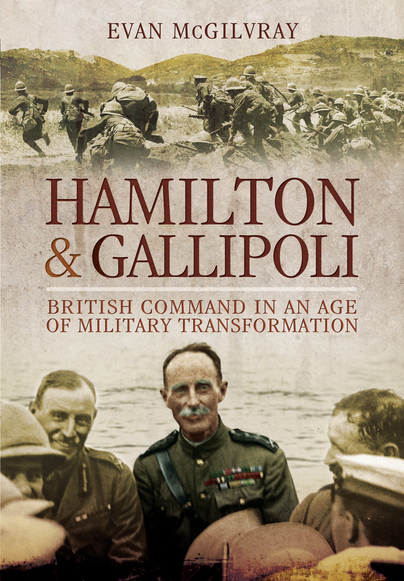 This is a well-researched and thoughtful book that gives us a useful insight into the mind and character of the general who oversaw Allied defeat at Gallipoli. The book says that he was not the right man for the command of the MEF in 1915. McGilvray tells us that he was a gentleman, that he did belong to the age of deference and that he was a snob. Hamilton was a thoughtful man and he had been a good soldier in the pre-Great War British ‘police actions’ fought across the globe. However, he was too old for his post and despite some modern ideas he was out of his depth in a citizen army fighting a modern war. Nonetheless, he remains a fascinating character and the book has attempted to put a little shine on the general’s tarnished reputation. At the very end of the book McGilvray concludes that “Hamilton was a good man, but never destined to be a great man. That is his legacy – good but not great.” There are some who will agree and those who will disagree and as with all things to do with Hamilton, this conclusion will engender argument. The debate about the generals of the Great War and the struggle for their reputations continues. If you are interested in the Gallipoli Campaign or the debate about the Great War generals then this is a book for you.